Grace M. Wilkins married Herbert Wolcott Houghton, son of Edward Laray Houghton and Delia A. Wolcott, in Oct 23, 1921 at Warren, NH, USA, age 29 and 25. George Henry Houghton married Arleta C. Gray in circa 1946. James H. Houghton married Muriel L. Forrest in 1998. Leonard Howard Houghton married Doris Cook. 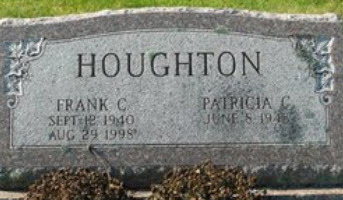 Peter Houghton married Gladys Booth in circa 1919 age 26 and 23. Alfred John Houghton married Lulu M. Signor in circa 1930.